Does physical decline directly mirror cognitive decline? 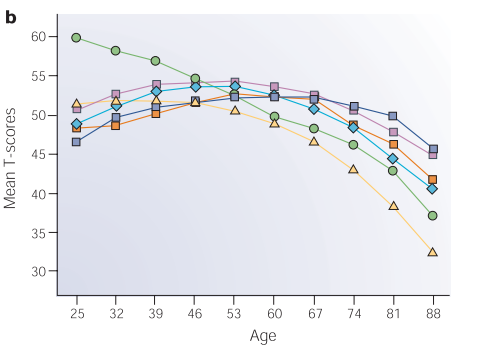 In a previous post I pointed out how after the age of 25 the brain is losing a proportion of its mass. But when we examined various cognitive measurements we observe that the peak for some cognitive abilities do not occur until we reach our 50’s. What about physical working capacity aging? There are many ways we could examine physical aging, but for convenience reason we can using running times since there are large data sets for this physical parameter. We could obviously use jumping distance, or how quickly we can dig a hole in the ground but the data set for these are limited. 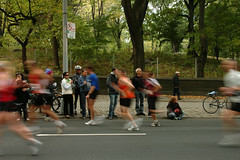 And another reason to use running is that is well studied for the purpose of trying to age grade races. The reason these tables were developed (which took a considerable about of work and data crunching) were to enable athletes of different ages to compare their ability. These tables are used widely for Master athletics. 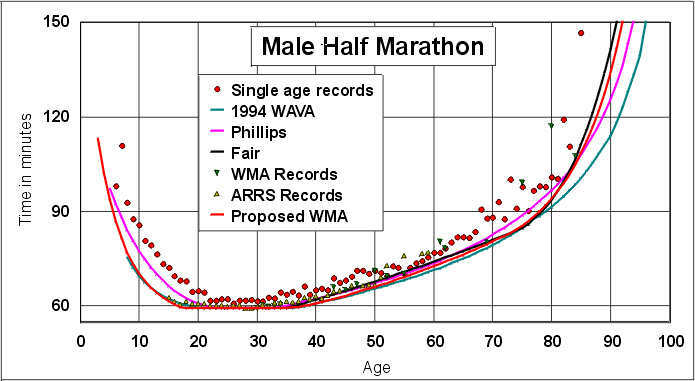 So here are a couple graphs for the half-marathon to use as a measurement for working capacity as we age. In females the fastest times occur between the ages of 20 to 34ish, and then start to rise. 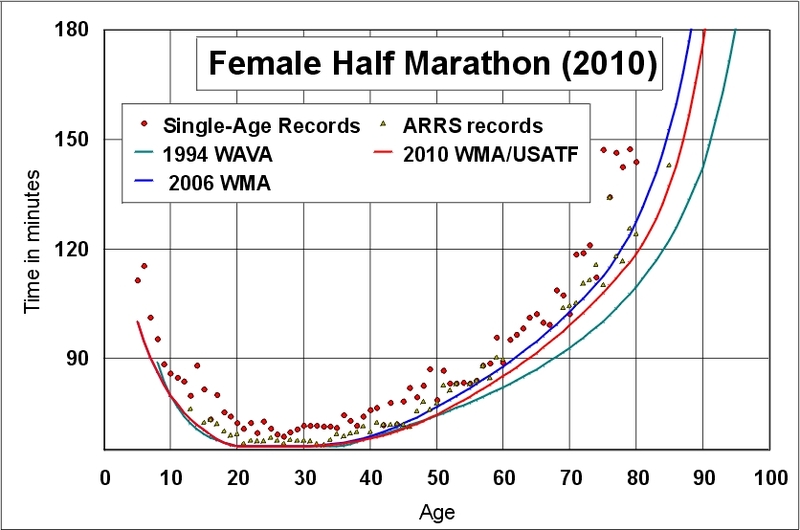 From this you could say that after the age of 35 females physical running ability starts to decline (on average – there will always be exceptions) (for the record – the current world record in the half-marathon for females is 66 minutes and 25 seconds). And roughly speaking for every decade there is an increase of 8 – 10 minutes to the running time, which equates to approximately 12% increase in time. For the men we see similar trends. The world record of 58:23, which according to the graph lines could occur between the age of 18 – 37. And again we see this steady rise after this time point. Taking the age bracket of 40 to 50 we again observe this approximate 8-10 minutes increase (13 -17%) in time over the decade period. And this appears like a fairly flat line up to about the age of 75, and then there is a sharp decline (increase of time) of performance. Now there is a slight difference in rate of curve between the males and females, but this likely reflects cultural influences that are different between the current 20 -35 year old females compared to the 60 and above. And I think over the coming years we will see that the curves of the males and females will become very similar. And I think these physical results would agree with what most of us have observed in life. Physical working capacity starts to deteriorate as people near 40 years old. Is there a difference between physical performance aging and mental aging? This is the bigger question, and the one we are interested in for today’s post. If you compare the first graph on cognitive ability changes over different ages to the half marathon abilities we notice some differences. Physical working capacity starts to drop off at 37-40, but for many of the cognitive functions the drop does not occur until mid-50’s. There appears to be 15 to 20 year differences between work capacity aging and cognitive aging. What I wonder, and would be interesting to test, is are the two related at the individual level? As in if we took a sample of people and recorded their work capacity every year or so along with their mental capacity would we see a 15 to 20 year lag between the drop of physical capacity and mental ability? Obviously, there are going to be individual differences of when physical ability starts to decline, and at what rate. Could we use the physical capacity measurements to predict mental decline, and would it occur at the same rate, just 15-20 years delayed for each individual? There is evidence suggesting that physical and mental decline are correlated in general, but I will leave that for another post. Physical working capacity starts to decline as we near 40 years of age (at least for the half-marathon). But our cognitive ability has a considerably delayed decline compared to our physical capacity (15 – 20 year difference). The two might be related? Even if they are not related do what you can to prevent the loss of both your physical and mental capacity. Keep active – exercise and keep your brain fully engaged in whatever interests you – learn new things, explore new worlds. ← Can mindful meditation reverse brain aging?